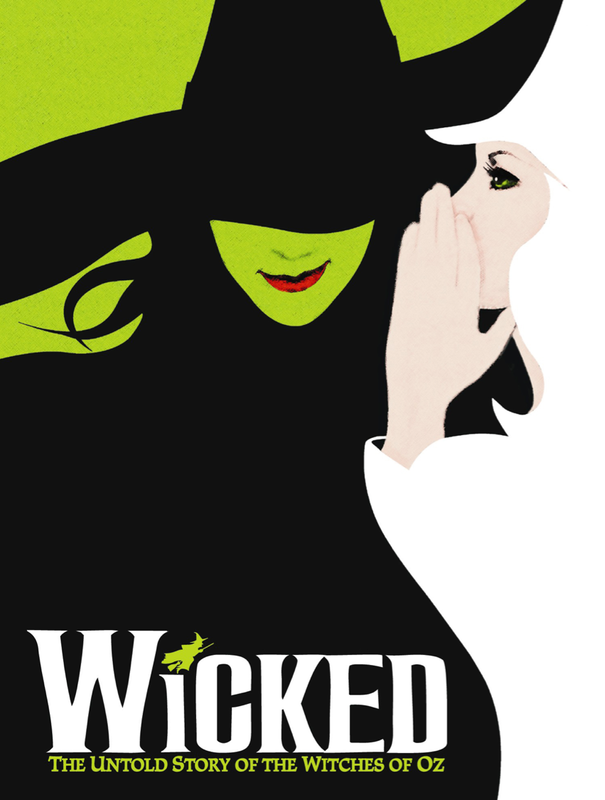 Wicked: The Untold Story of… How Much I Love This Show! In 2003, the musical Wicked premiered at the Gershiwn Theatre on Broadway. From the start, this show was a success. It quickly became a true phenomenon of fan dedication with crowds filling the theatre on Broadway, and many others all around the world, steadily for the past 12 years. In 2004 the show was honored with three Tony Awards and with 7 other nominations. The Durham Performing Arts Center is the latest in a very long line of venues to play host to this juggernaut of stage success as they welcome the Munchkinland Tour to their stage for 2 weeks of shows. My tour of Munchinkinland began under the watchful eyes of a dragon that was omnipresent throughout the show. A giant map of The Land of Oz was projected on the screen. I studied it closely and I memorized all the local attractions listed. I even deciphered the map legend. From the program, I reviewed the bios of each member of the cast so that I knew who I would be traveling with. My excitement grew to the point where it bordered on frustration that the show would not begin when I wanted it to. Having been a fan of the original Broadway production, I had set some very high expectations for the performance that I was about to see. On the other hand, I knew going in that I wouldn’t be hearing or seeing the originals that I have pictured every time one of those memorable songs comes across my Pandora station. To be honest, of course I would have preferred to see Kristen Chenoweth, Idina Menzel, and Joel Gray in the performance. But I put that aside in hopes of seeing the beginnings of a new generation of Broadway caliber performers; I was not disappointed. Each actor that took the stage brought new, fresh qualities to characters that I already loved. Carrie St. Louis, Laurel Harris, and John Davidson took on the roles of Elphaba, Glinda, and Oz respectively. As high as my expectations were, I didn’t leave wishing I could erase the performance from my memory. Quite the contrary, I played their scenes over and over in my head all the way home. Now, with an even more enhanced love of the characters and story. It is very difficult for any actor to step into the character shoes of a previous actor. Harris and St. Louis had some very large character shoes to fill. Each woman brought their own interpretation of the character’s personalities to their respective roles. While they were not able to change the music or movements, the two added their own original characterizations and vocal tones that garnered them a much deserved standing ovation for their phenomenal performances. While the performance of John Davidson did not jump out at me in a positive way, he also did not take anything away from the show; his performance was solid. From the performances themselves, there is no way to find one musical number that stands out on its own. Each song is beautifully written by Stephen Schwartz and performed with such conviction by all cast members. That being true, one number in particular brought me to tears. For Good is a gut wrenching song that describes a moment that all of us can relate to; thanking a dear friend that has created the biggest impact in our lives. The lyrics “Because I know you, I have been changed for good” describes my small obsession with this musical. The tears that I shed during this song were close to sobbing like a little girl who has found lost her puppy. Costume Designer, Susan Hilferty is a genius! The spectacular costuming brings to life the odd, magical, mysterious, illusionary characters from the land of Oz. Hiferty uses strange angles of hair, crazy uneven hemlines, over the top colors, and cute preppy clothes to create distinct visual personalities of each character. Nowhere is the impact of the costuming more apparent than with Elphaba and Glinda. As the play opens you soon feel the anguish of a person who is different, who doesn’t fit in, and who is a social outcast. In the world of Oz the costumes feed the irony of what is “normal” and what is not. Set Designer Eugene Lee creates a beautiful city that all audience members wish to travel to. Each scene change was a flawless transition that offered audiences a spine tingling representation of what the other side of the rainbow could be. There is never any doubt about where you are, and there is never any doubt about how this musical ties into the Wizard of Oz storyline. Kenneth Posner served as the Lighting Designer. The scenes featuring Shiz University, Ozdust ballroom, the vacant castles, and the cornfield are beautifully illuminated by a phenomenal light design. The lighting also is a crucial element in creating the most spectacular of all scenes; Elphaba’s first flight during the song Defying Gravity. James Lynn Abbott brings a new and fresh dance arrangement to the tour. The unique and innovative dance moves are reminiscent of Bob Fosse, with leaning poses and no straight lines. The well-choreographed dancing number Dancing through Life is fun and carefree, clearly demonstrating the laid back and fluid movements of Fieryo. How can you truly interpret someone’s actions? One must listen and watch to have a true understanding of what is going on around them. Don’t pass judgment, because things aren’t always as they appear. The most unlikely combination of personalities can result in a most rewarding relationships.